Well that was a quick break, right? 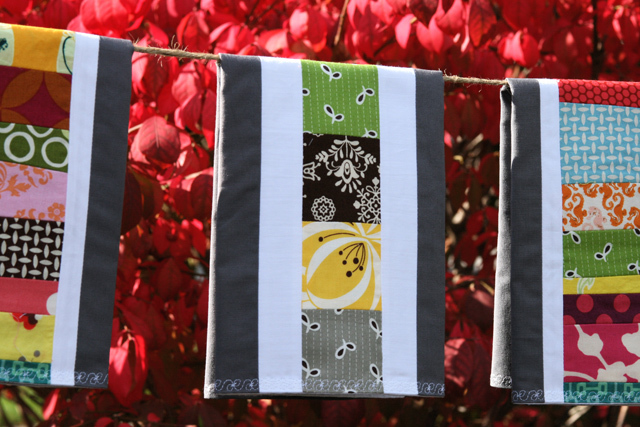 Actually, this is just a quick post to let you know that I have a new tutorial for patchwork napkins available. It’s posted today on Sew Mama Sew, so if you haven’t already been over there, head on over and take a look! Be sure to check out all the other wonderful scrap projects as well! And now, back to my break! This entry was posted in Household Goods, Tutorials and tagged Napkins, patchwork, scraps, tutorial. Bookmark the permalink. 38 Responses to patchwork napkins! Thanks for this great tutorial! I hope it means that you won’t be gone for too long. We’ll all miss you – you have so much to offer. Maybe all the positive feedback will help. Take a break for as long as you need. When you are ready to come back, we’ll be here. What a great idea…a perfect way to use up all those scraps i have. Thank you! oh man. i love that grey. is that the kona charcoal you like so much? that’s on the backside of the nine-patch? that back is the most exquisite thing i’ve ever seen. and i also show-n-tell’d…show-n-told? my little quilt you inspired me to make today on my blog. :o) can’t wait to get better and make some more white or other solid like a putty or khaki…I want to try that…or grey, something neutral. sheesh. back to your scheduled program. LOVE the kona charcoal. You trendsetter, you 🙂 I can’t wait to try these…thanks for the clear tutorial. Wow~ Wonderful! Can’t wait to try! I really love these napkins and think they will make a great gift. Thank you for sharing! Those are so cute!! I will have to try them! I saw these on Sew Mama Sew this morning. I knew they were yours as soon as I saw the charcoal Kona!! I can’t wait to make them. I’ll keep checking on you in hopes that you return to the blogging world soon! Just in time for Christmas!!! Thanks Ashley! adorable! i can’t wait to make them. perfect for Christmas! Thanks for the tutorial! I want you to know that you have been such an inspiration to me. I had quit quilting for so long and have made four quilts in th last few months. I credit you as an inspiration and have sent your blog link to so many friends. I think you need to wrtie a book with your quilts and techniques in it. I would buy it for myself and others. Thanks for all you do. Love these Ashely! Off to Sew Mama Sew!!!! thanks for the tutorial, don’t give up!! just want to let you know how inspiring you are. just made 2 bed sized quilts based on your kaleidescope tutorial, one for each niece. they turned out great thanks to your wonderful instructions. i am so grateful. even if you start charging for your tutorials, which may not be a bad idea, i would buy them in a heartbeat. you have a gift!!! I love these napkins, Ashley! I’ll make some for Christmas if I can just squeese in some extra hours in the sewing room; my family would love them too. What a Wonderfully Clever way to quilt something small, and less overwhelming. Very inspiring for any novice. Great idea! Wouldn’t they make the best hostess gift over Christmas? Thank you again for one of your fabulous tutorials! I’m sorry I don’t comment often, but I wanted you to know as you start on your break, that your work inspires me and your blog is often the first one I read on a daily basis. I learned how to quilt the traditional way, but this wonderful on-line quilting community has encoraged me to branch out and explore the world of modern quilting. Enjoy your break and know that we (your faithful readers) will be here to cheer you on whenever your ready. Thanks for sharing the tutorial. I was not able to post a comment on yesterday’s post, but wanted you to know that I am sad you are taking a break just when I found your blog. I absolutely love it. I’ll keep checking back for when you return. Enjoy your break. Blogging should be fun…not stressful. Too bad there are mean people out there. A one day break! That did make me laugh- rest up, for heaven’s sake! But the fact that you have announced a break and here we all are anyway, still logging on and looking, has to tell you that will you be missed. Take it easy and know that we will be here when you are ready to come back. Hi! I just wanted to tell you I love your quilts! I ‘found’ you a month or so ago and I guess have lurked . . . I just showed dh some of your pix and he really likes them too. Thank you for sharing–it is quite an inspiration. I am about to try free-motion for the first time. 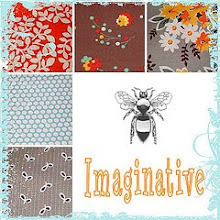 Love these napkins, too–hope to try them also!! I love your blog. I have never wanted to quilt until I found your blog. You have such a way with fabric! Thanks for sharing it with us! I have to post here b/c the other spot is full 🙁 I want you to come back!!!!! You inspire me and many others!!!!! Do not let a certain few petty people keep the rest of us from enjoying your blog and learning from you. I have suggested this blog to many people and they all love it! You have a gift of sewing and blogging (storytelling and sharing) keep it up!!!!! Hmmm…I think those napkins are going to be the hit at the Yankee Swop! Hope you are really taking a break and enjoying the breather. I don’t blog (my life is WAY TOO DULL for anyone to read) but my friend who does says that it’s necessary to pull back at various times. Sorry you are in that spot now, but when you’re ready for models or folks to hold up the projects for pictures, let us know. I’ve got a few kids who LOVE to show up on your blog! hope you do blogging again soon, but hope you enjoy not blogging! your blog is great – one of the first ones i found and bookmarked! your work is inspiring – i love how you use colour. Hopefully the time away heals your frustrations. I must admit that I would love to copy every single one of your quilts. They are beautiful and exactly my style. Unfortunately, I don’t have the knack for matching colors and fabrics. You are an inspiration to me and obviously to those that imitate you too. I hope that you find your way back here with more quilts and designs. Take care. simply fabulous, thanks for sharing! Hey Ashley, Sorry if I scared you in Strawberry & Rhubarb the other night! I did think of a couple of great classes you could teach. 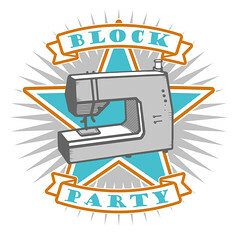 An improv block or a block from your string block paper piecing tutorial. Let me know if you are interested. Love your stuff! What a great Idea Ashley! I will certainly have to make these because I have soooo many scraps!! Thanks so much for sharing!! beautiful napkins! enjoy your break! I made these and I wanted to thank you for providing this fantastic tutorial! I saw yours and thought they were so beautiful I had to make a copy. Thank you again! You are crazy talented! !